Hello and welcome to an unusual recipe post, sort of. BBC1 here, I have mentioned in the past that I play different kinds of on-line games. One of those is called Samurai Siege and I have been having a conversation with a fellow player about food for several weeks. His name, in the game, is Spotted Monk and he is a medical student. Students being renowned for their slap dash approach to food and eating, I and another member of our team have been berating him to eat more than beans on toast! To my surprise he told me he had been experimenting and came up with an idea for a pie. After he told me, I said I would think about it, talk to BBC2 and see if we could develop something. I told him I would post it to the blog when complete, with full credit to him and that in his honour I would call it Monkey Pie! 1 egg and 2 tbs milk whisked for a glue and a glaze. To make the pastry put the flour in a food processor and pulse for a second or two to aerate the flour, then add the cold cubed butter and lard and pulse until the mixture becomes fine breadcrumbs. Now add the beaten egg and water mixture while the motor is running, the mixture should come together in a ball. Stop the processor and pinch the pastry between your fingers and if it holds its shape then remove it and wrap it in cling film and pop it into the refrigerator, if it crumbles add a little more cold water, but be careful not to add too much and make the dough sticky, just a drop. Preheat oven to 170c fan. To make the filling. Place the chicken stock into a saucepan and bring to a simmer. Add the sliced carrots and the whole chicken breasts to the stock and poach for twenty mins. After twenty minutes remove the carrots and the chicken breasts to a plate using a slotted spoon and allow them to cool. In a heat proof bowl place the stuffing mix and use approximately just under half a pint of the hot stock to reconstitute the stuffing. Mix with a fork and leave to cool for a couple of minutes whilst you remove the skins from your sausages. Now add the sausage meat to the stuffing and blend thoroughly with a fork. Leave the mixture to one side to cool completely. Once the chicken and carrots have cooled completely, cut the breasts into bite sized pieces. Take your pastry from the refrigerator and on a floured surface roll two thirds of it out to a thickness of about an eighth of an inch. So that it is big enough to line your pie dish. Retaining the other third to roll out for the lid. 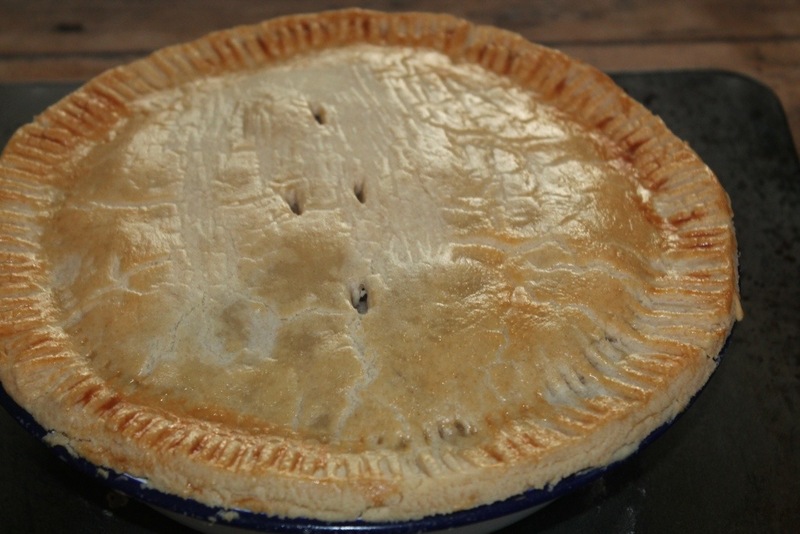 Once the pie tin is lined you may want to place it back in the refrigerator for twenty minutes to cool down again. 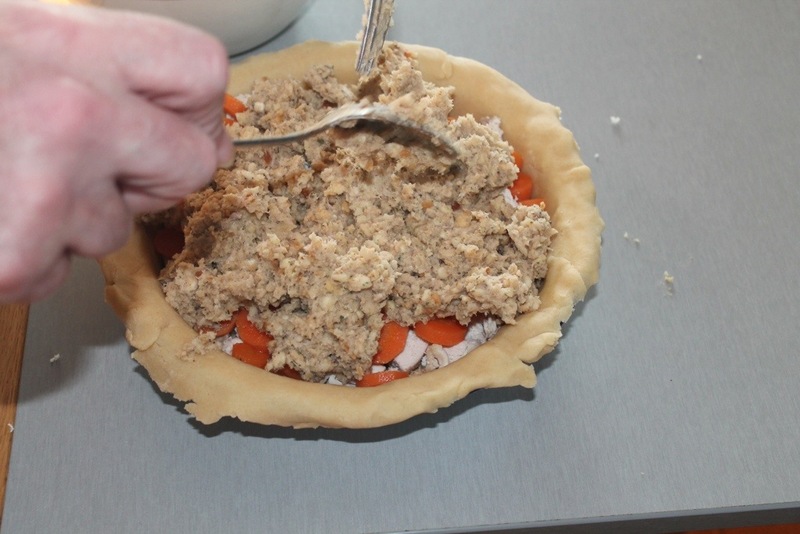 Once the stuffing mixture is cold you can begin to fill your pie. Using about a third of the stuffing to put an even spread across the bottom of the pie. Then place the pieces of chicken on top of this to ensure they are spread throughout the pie. Next place your carrot slices on top of the chicken. 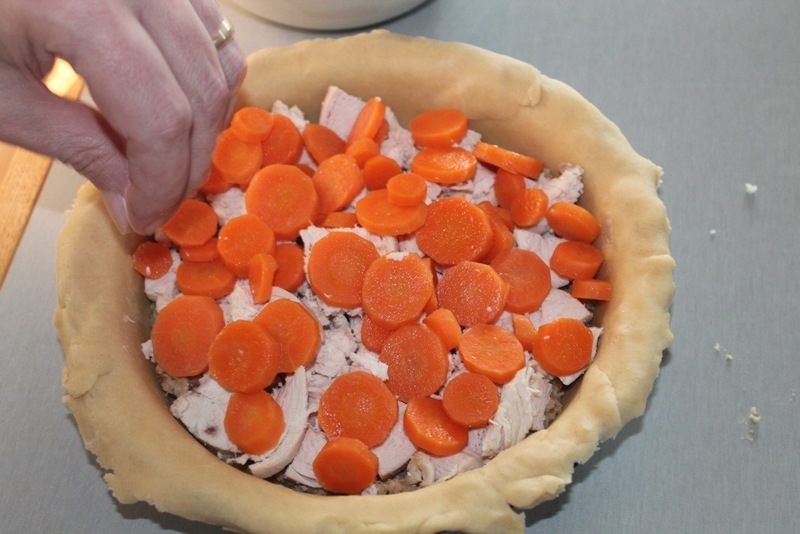 Then use the remaining two thirds of the stuffing mixture to cover the carrots and the chicken. Roll out the remaining third of the pastry on a floured surface. Using the egg mixture to brush a little round the edge of the pastry in the pie dish to help seal it. Then using your rolling pin place the pastry lid onto your pie. 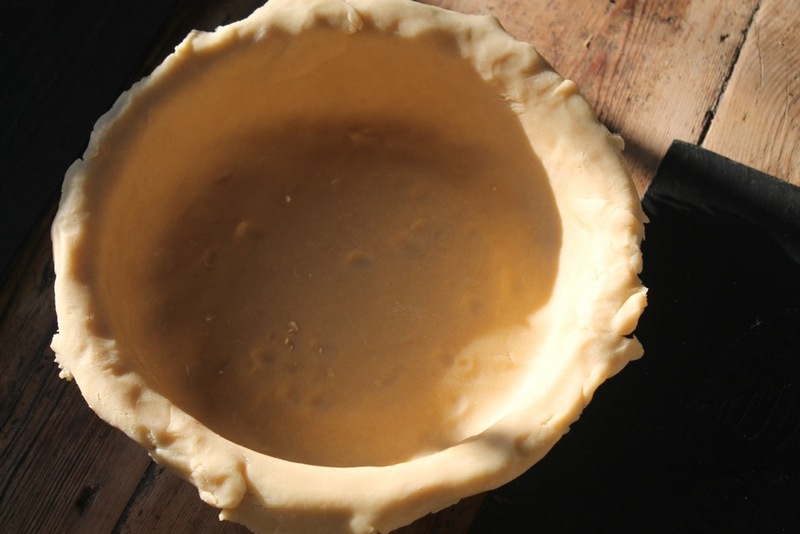 Crimp the edges with a fork to ensure it is sealed and brush the top with the egg mixture to glaze the pie. 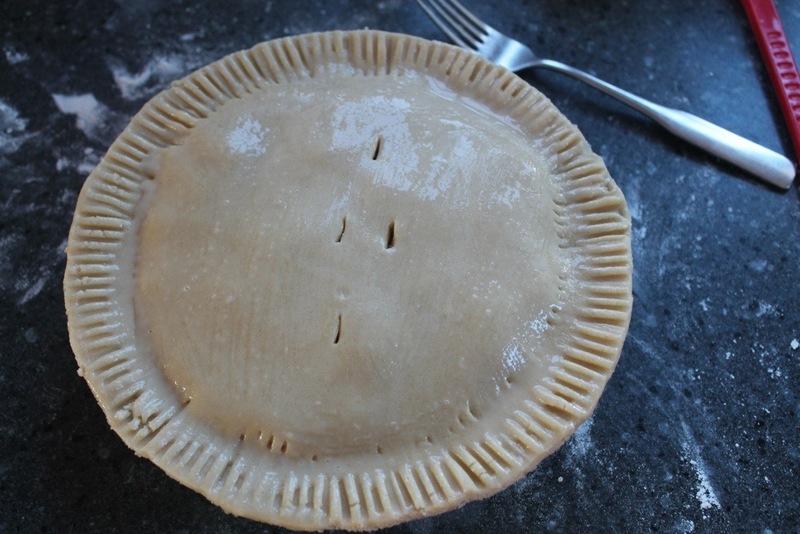 Cut two small slits in the top of the pie to allow steam to escape. Place the pie dish on a baking sheet and place in your preheated oven for approximately forty minutes, or until the pastry is cooked and is golden brown. We used the remaining pint of chicken stock to make a gravy for the pie. We roughly chopped two sticks of celery, half an onion and one carrot and placed these in the stock and brought it to boil. We then turned this down to a simmer and left it for twenty to thirty minutes. You made need to add another half to a pint of chicken stock to this, depending on how much gravy you like. After thirty minutes or so we removed the vegetables with a slotted spoon and discarded them. We then added a couple spoonfuls of chicken gravy granules to thicken the stock and a teaspoon of HP or brown sauce to add a piquancy to gravy. You could use Worcestshire sauce. We had the pie with roast potatoes and peas. Just like a roast chicken dinner in a pie! 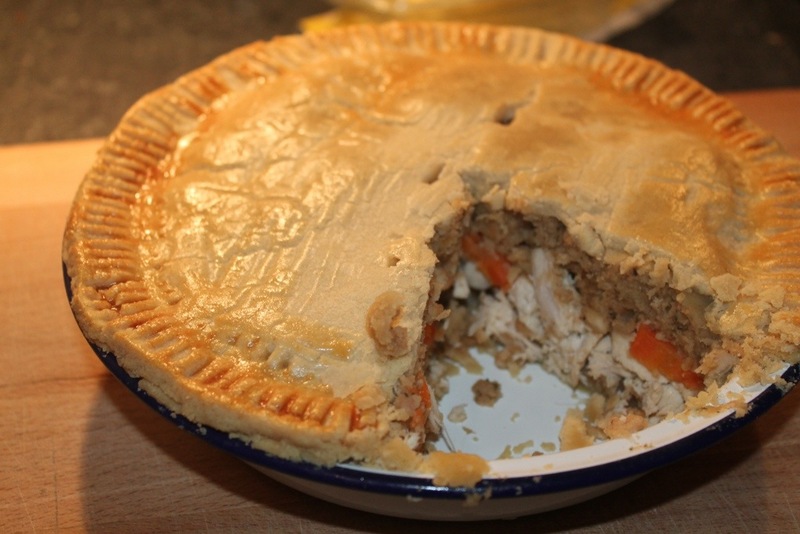 The pie is also really good cold and would be ideal for picnics, lunch boxes or a buffet table. Tags: carrots, chicken, chicken pie, pastry, pie, sage and onion, sausage meat. Bookmark the permalink. Why was i voted out? I have just seen you came back today…I have asked why and will take this further. Am not Shogun at the moment as have been too busy…. Come back, have spoke to guys and you should be ok. But do realise that game moved on and and so have people. Need to crack on. By the way, how the studying going. Do we get to call you Dr Monk yet? Ok mate. Do keep in touch whatever you decide and good luck with your final year and subsequent placements etc! We think it’s a great idea and you could mix and match veggies or types of stuffing. Hope you enjoy! Mmm! I love savoury dinner pies and this one sounds delish!